The shirt is holding out but it may never regain its original shape. Lets hope for better from the belly. This weekend was a blend of busy and quiet. Lars left on Friday and I pigged out on TV watching way more then average. In contrast, I ate far less real food when Lars isn’t around to cook but I ate healthy stuff so I’m fine. Friday at work was our yearly profit sharing, a week long celebration where every day is a theme and there are lots of fun activities and on Friday there is way too much food because everyone brings in something and the highlight is getting a nice big bonus check and everyone is free to go at 2pm. Most people go to bars and celebrations and I went home for a nice nap and some time with Lars before the event. I just about made myself sick with too much rich and sweet food so dinner of a bean burrito and a bunch of carrots was perfect. Saturday I went to the bank to deposit check (2x’s what it was last year!!!) then to Ikea to meet Shannon for an adventure with a 1year old and a very large stroller but really it was a very enjoyable trip. Then I went to Jo-Anns where I got a bunch of fabric for baby slings but was disappointed when a home dec fabric I specifically remember being there is now a custom order only. I decided to try my luck online and found exactly what I wanted on clearance at Fabric.com and it is on the way. This fabric will complete my room, I want to use it in a few different ways and once I’m done I’ll post. I also got invitations for something we are doing for our reign, original plan was to use do it yourself wedding invites but I shopped around and got them printed and personalized including custom envelops and expedited shipping for less then the do it yourself ones would have cost. Now all I need to do is my addresses and some envelope stuffing and we are on schedule because I wanted them in the mail by March 1. Sunday I pulled out all the baby clothing from all the corners of the house and sorted them, I have a huge pile of 0-6 month staples; tons of onsies, night gowns, and some little outfits. Either they are not necessary or they don’t survive multiple kids but there are not all that many outside outfits in the pile but I’m not joking, it is a huge pile! The piles for 6-9 and 9-12 are much more normal looking… I just will have to wait and see if this particular kid actually fits clothing as the labels dictate but having 6 months worth of labeled stuff out should cover at least the first 4. This week I must start washing all this stuff, there are atleast 3 loads, maybe 4, but I won’t have a naked baby by any means. Sunday I also grocery shopped and did some e-mail stuff and the only thing I really did not get to this weekend was getting our tax stuff together. I can’t put that off for too long but it also should not take too long to compile. Lars was gone from Friday at 6 until Sunday noon and I think this is probably the last weekend for a really long time I will have that much time solo. I don’t really like being alone but there are perks like doing whatever whenever but I am very happy for his company even when we are both doing our own thing I feel better having him around. Good sign for the marriage I suppose J 8 years together and I still want him around. This week is busy again, I have a big list of work stuff I need to get done before I leave and I think I should get going on it now so nothing is super undone if I end up going out early. Tomorrow I’ll post the next belly picture, I caught my profile reflection two days ago and was pretty amazed that I really am pretty big. I don’t feel as big as I look, I can still bend and sit and get up where ever and when ever I want but I am growing out of my maternity stuff, risking more gaps every day. Only 5 more weeks (or so) to go! No official belly picture this week, but I did get a sonogram to check in on size and dates. Everything looks good according to the tech but everything is so squished in there the photo opportunities are very limited. I uploaded the two that were decent from today and 3 from a month ago where there was more room but she was just being shy. This picture (above) is as close to a profile as we could get, the thing that looks like a nose is not, it is her other hand, she was sucking her thumb or waving most of the time. I wish I could draw on the picture because the real profile is there just hard to see if nobody is pointing to it. 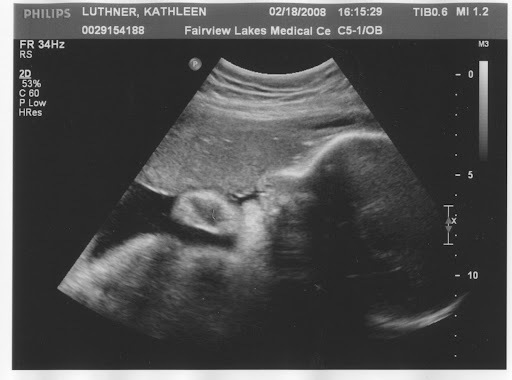 The other picture (in gallery) is of her nose and lips and I don’t know why it looks like she is peeking through an odd shaped hole but I think it is just how sonograms work, they can slice any witch way and some views are just weird. The tech was really excited about this picture, she was highly excited overall but I think it was due to nerves because she really did not know how to use the brand new machine in the room and was frustrated that it was not the same as the old ones. So a 20 min scan turned into a 40min scan, there are worse things in the world. We also have good confirmation on girl parts, no pictures because that would be wrong, but I have witnesses. I also put the very first sonogram and all my collection in a Picasa album so feel free to check them out. I’m not normally a linker but Martha has found a way to turn her dogs hair into knitable yarn by using this company. I am very behind blogging because I have had a week of nonstop work but finally today the project turned the final project and should be done by Monday. This was supposed to be a small no big deal project that needed to start in Jan and should only take 20 hours or so of work… it turned into a huge monster that took atleast 4 hours every day since Jan 1 and I still had to keep a handle on my other work. Most days I can’t even read any of my blogs until I get home and I was getting home later and later therefore I never got around to writing. I have been invited to a national blog month off shoot – write every day of a given month on a given theme, the theme of March is lists and I can get behind that so you all might be seeing a month of lists in addition to my general chatter. Valentines day was actually kinda nice. I went into the day with zero plans other then Thursdays Lars and I tend to be able to spend the most time together since we don’t have any other commitments. Through fate I ended up wearing a red shirt because I honestly forgot it was valentines day yesterday when getting dressed but it was a nice coincidence. At lunch at work the chef (who is lousy at most food but great with desserts and pastry) had very nice looking desserts all packaged up so I got two to go for after dinner. When I got home at 5 there was a few inches of snow on the ground but Lars did the driveway and then he cleaned for about 30min, the best gift in my opinion, and I worked out and we made a nice pot-roast and veggies and bread dinner. Lars was even extra thoughtful and lit candles for dinner and set out the pretty crystal champagne flutes and our favorite vintage of gingerale (at least a year old at this point but those little glass bottles really keep the stuff bubbly!). We ate dinner and watched the final episode of Dexter and the first two episodes of another Showtime show Brotherhood and then I ranted a bit on my project and went to bed. I don’t think I could have planned a nicer evening and if I had tried to plan anything it likely would have gotten changed anyway. This weekend is a local event, 2 ish hours away so I need to pack tonight but most stuff is together already because of all my organizing this past weekend. Sunday I hope to do a bit more in the baby room, I have the floor plan done in my head now it can be executed. I also need to find all the baby clothes stashed all over the house and garage and take stock of what I have and need and get that under some sort of control. I think those chores will probably exceed my energy level of Sunday but I am running low on weekends. I also must start a scroll commission, I know what I want to do now so it is just a bit of research and then I can block it out and get going. Paint fumes – I’m painting using water based paint that advertised ‘low fumes’ and you really can not smell it at all unless you are right next to it. The annoying thing is the paint also said it was ‘one coat, no primer needed’ and that was a big lie because it really needed 2 coats to not look like it was primer. I’m also painting in an open room in an open floor plan house and since it is -10 outside painting inside is the only option. What does a Dulia do – A dulia is a non medical support person. She knows the system and the common (and uncommon) things that come up during a delivery and she is there to make sure we are informed and comfortable. Sometimes L&D nurses might not mention options that are very good for the patient but more annoying for the nurse, same with doctors, so our dulia is there to make sure there is none of that happening. She is also in charge of taking pictures for us since I usually do it but I’ll be busy and Lars either forgets or has very lousy composition. She is going to come over to our house when I feel like I’m in labor and stay with us until the baby is born and eating. What is special about the Arms reach Co sleeper? – I like this particular bassinet thing because it hooks onto our bed and one side goes down so the baby is really easy to get in the middle of the night without the risk of being elbowed in the head or rolled on, or, having the bassinet scoot away on our slippy wood floors. It is like a baby peninsula rather then an island… After bassinet time is over, this turns into a pack and play that travels and folds well so it is a 2 in 1 thing. I think that covers most of the general interest comments. Sunday Lars and I did very little to further the progress of the house. We went to costo and watched 6 episodes of Dexter and that is about it. It was nice to go to bed a little early and be almost refreshed for the start of the work week.